Flying in business class on intra-European flights is like flying economy class, but with a tiny bit more comfort and at least some food and drinks. We all like to moan about British Airways Club Europe but is it really so bad when you look at the competition in Europe on short haul flights? 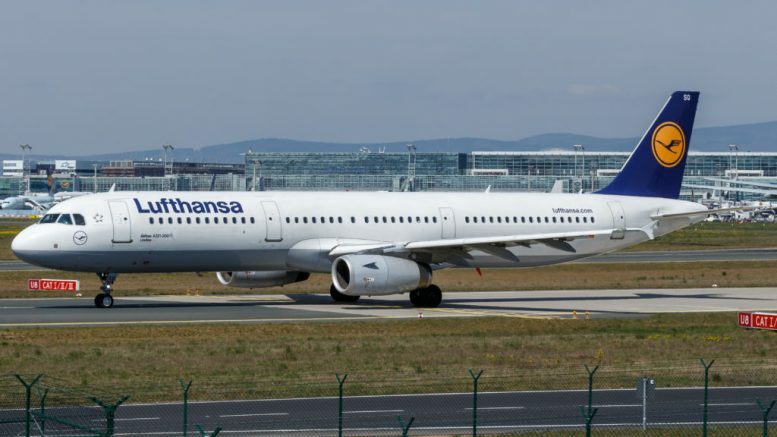 In today’s article, Claudio reviews his Lufthansa flight between London (Heathrow airport) and Frankfurt. 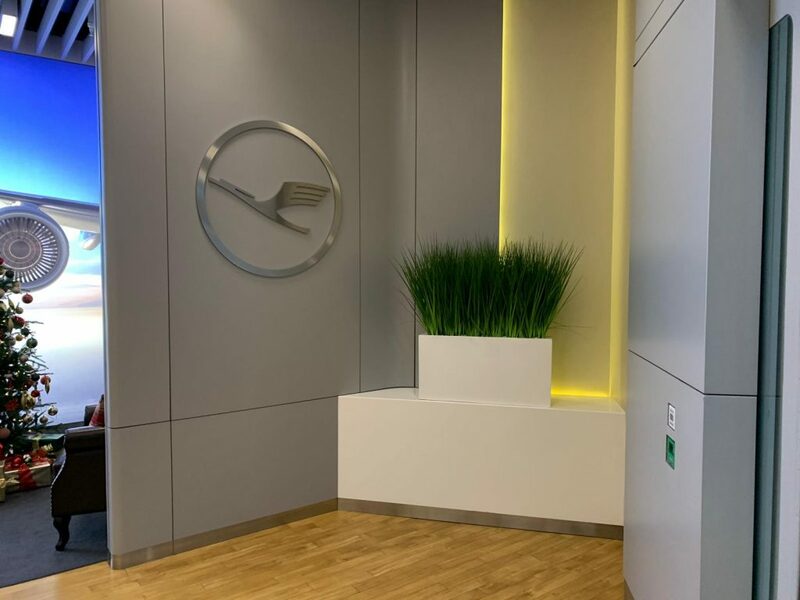 My complete itinerary was between London and São Paulo with a connection in Frankfurt (we will share the review of the flight between Frankfurt and São Paulo shortly). I arrived in Area B of Terminal 2 at Heathrow, where the Lufthansa group’s check-in desks were. I headed to the business class counter and was attended to immediately. I think that because it was early afternoon everything was very quiet. I even had a brief chat with the friendly check-in agent. The agent was proactive and asked me if I would like to change the seats that I had previously chosen. He even showed me his computer screen so I could see the seating charts which rarely happens. Obviously, it is hard to compare the experience with BA as I am a Gold card holder and would typically use the First Wing at Heathrow which is a fantastic experience. In the end, I stuck with my original seat that I had pre-selected, and in a few minutes, I had my boarding passes in hand and confirmation that my luggage would go straight to Sao Paulo. Finally, the agent told me which lounges I could use. Terminal 2 is like the equivalent of Terminal 3 for Oneworld in terms of lounges. 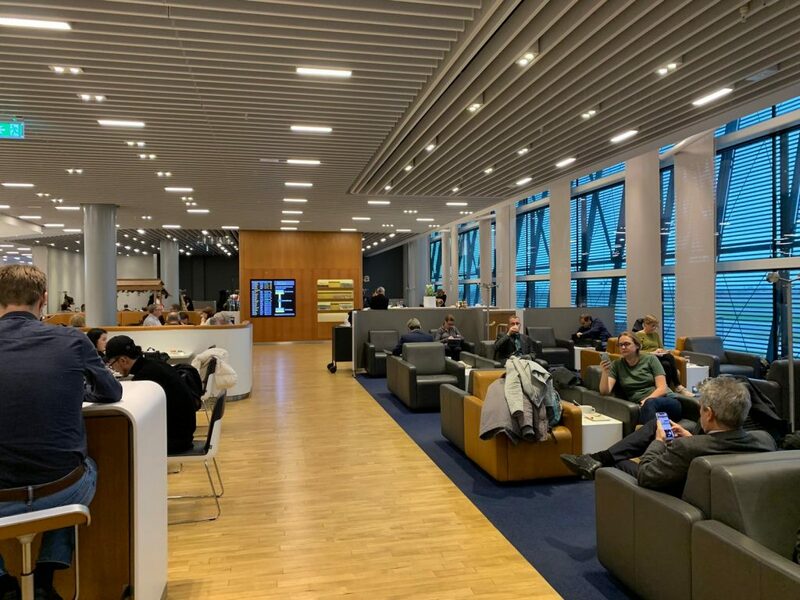 There is plenty of choice with the Singapore, Air Canada, Lufthansa and United lounges available to visit when you are flying on any Star Alliance Airline in business or first class (or have status). I went to two lounges but I will just briefly cover the Lufthansa lounge here. As soon as my check-in was completed I received an email from Lufthansa with the code of my luggage and a link to access if it did not arrive with me in Sao Paulo (they refer to it as delayed luggage). I liked the initiative! This is definitely an improvement on BA which to my knowledge don’t do anything like this. I won’t go into too much detail as I will be doing a separate review later. 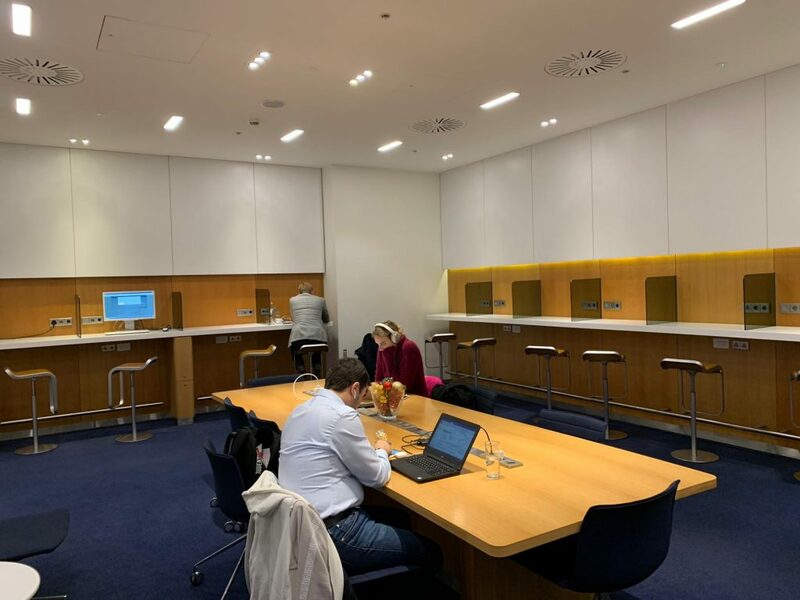 There are two lounges for Lufthansa. The business class one for silver/Frequent Traveller card holders and business class passengers, and a Senator lounge for Gold card holders and those connecting to a First Class flight. The lounge was quite dull in design but had everything you would need. There were hot and cold food selections including a choice of two soups and some pasta. For drinks, there was no champagne (which you do get for BA business class – often only on request). They did, however, have a decent Prosecco and a few wines to chose from. Spirits were pretty standard, but BA definitely has a broader choice. You can see a selection of the food and drinks below. 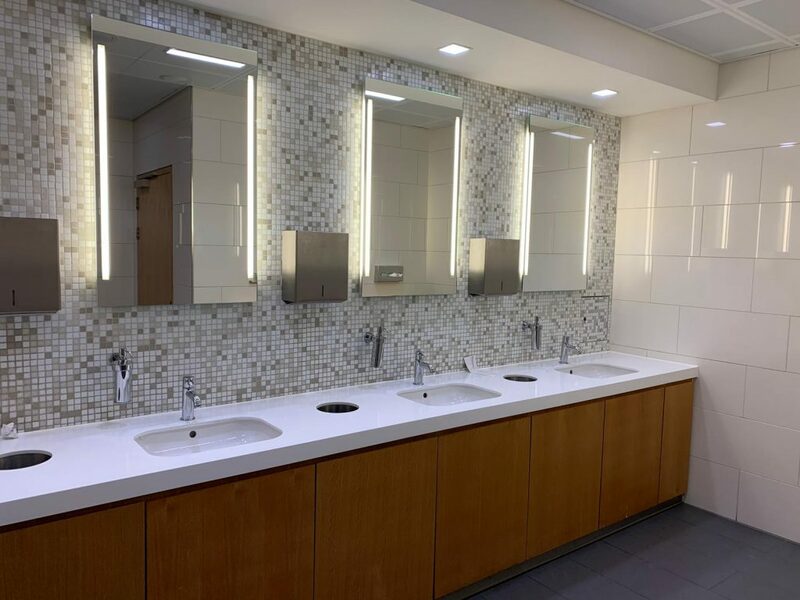 There was a separate work area which was pretty quiet being a weekend and I have to comment on the toilets which were very nice – definitely better than BA’s hospital chic look at Terminal 5! The aircraft was an A321 and the flight was very full, especially in economy. While we waited to board, the staff circulated the gate area asking some passengers to check in their carry-on luggage. I think they did this to prevent the flight from being delayed (beyond the 15 minutes delay we already had) by people trying to find space for their luggage. This is something BA also does proactively even to the point of sending messages in advance asking people to check in their hand luggage for free. Now what really caught my attention was the Priority boarding process. Let’s face it BA’s group process doesn’t always work that well, but this wasn’t that much better! It was comical because as soon as Priority boarding was announced all the passengers – people travelling for business I would say for the most part – crowded in front of the boarding pass scanner, in a scrum with no line whatsoever! The gate staff had to get up and “help” them to form an orderly queue! As I said above, business class on intra-European flights is a paired down one compared to long haul. The seats are exactly the same as economy with the difference that the middle seats are blocked. Like BA it featured a middle table which is always useful if you want to work and have somewhere to put a drink. There’s not much else to say about with the seats, apart from the fact that I found the legroom between the seats quite generous compared to other airlines, for example, on British Airways. As for the on-board service, the cabin crew distributed the meals, then offered round the bread basket. There was no pre-meal drink but drinks were provided with the meal and then for a second time. The crew was amiable and one of them was Brazilian like me, so we soon started talking chatting! The meal … ah this could have been better! Of course no one expects a banquet on a 60 min flight, but at least Lufthansa could serve something tastier! It was a cold dish, and as you can see in the photo, it came with a piece of salmon, two slices of red pepper, a kind of pork pie and a sauce which I still don’t know what it was. What a strange combination! I only ate dessert…. I think in this respect BA is definitely ahead of the game in Club Europe. As for drinks, there was the usual: champagne, beers, white and red wine and some spirits. The flight and the service were exactly as I expected. Regardless of the quality of the food, Lufthansa always offers consistent service and the crews are professional and friendly. In terms of a comparison with British Airways, there is probably not much in it. The food on board is definitely better on BA but the drinks were comparable. The seats are pretty much the same but there is more legroom on Lufthansa. It all boils down to price and whether you want to collect Oneworld or Star Alliance status. 7 Comments on "Is BA Club Europe so bad? Lufthansa A321 business class review"
Seat comfort I would say LH shorthaul is the most uncomfortable back breaking experience on any sh carrier in europe. Is literally like sitting on the metal frame with some mesh fabric covering it up. Fine say for less than an hour but for a 3hr flight it’s totally unacceptable. 5star seat it is not. Exactly the same meal I get EVERY time I fly from Glasgow to Munich in Business Class. Odd combination to say the least! I travelled LH last year from LHR to Bilbao via Frankfurt. It was my first time with LH for over a decade. I used the automated check in, which was fine. I found the lounge in T2 had a relaxed, open feel. The food and drink offerings, though, were very basic. I prefer BA in this respect. Boarding was appalling. The gate agents were disorganised and unfriendly. It took ages. BA streets ahead there. Leg room on the Airbus was better than BA. Food was exactly the same on all four sectors (return ticket) and was good, if unexciting. BA wins there. Cabin crew were not very friendly on any sector, though I have to say a lot of the passengers were distainly and rude. BA wins on cabin crew AND passengers. I flew Swiss and TAP in 2017. Good food on TAP, friendly though inefficient service. Swiss poor in every aspect. BA wins hands down for me compared with Star competition for short haul. Have just flown Economy in Bangkok Airways. 50 minute flight from Bangkok to Siem Reap and return flight 45 minutes. There is plenty of leg room and we were served a 2 course lunch with water and tea/coffee. Nothing like Thompson, Thomas Cook, Ryan air, Easyjet, which we do not fly with now. Bangkok Airways even puts British Airways tof shame. The middle table is just in the way. I am a big guy. It just stops me lifting the arm rest up to get a bit more space. SAS Plus is as good as Lufthansa and BA and cheaper!